With her election as Deputy Mayor last night not yet four months in the job, Councillor Kylie Bonanni’s honeymoon continued alongside the excruciating spectacle of Cr Eli Melky’s increasing and mostly self-driven isolation. Cr Melky signalled early at last night’s committee meeting that he would be raising breaches of the Local Government Act in General Business. No prizes for guessing that it would concern the leak to the Alice Springs News Online that he had threatened a fellow councillor with legal action in confidential sessions of council. General Business is scheduled at the end of the relevant committee meeting, so before Cr Melky could proceed other business had to be got out of the way. This included the election of Deputy Mayor and the various committee chairs and members. It was an opportunity to observe alliances in action, as well as the interests and energies of various councillors. Cr Bonanni was nominated for Deputy Mayor by Cr Steve Brown, seconded Cr Brendan Heenan; she expressed her surprise but was clearly delighted. The role mainly involves standing in for the Mayor at various committees and functions when he is unable to attend. This is reasonably often as the Mayor is involved in a number of Territory-wide roles on the Local Government Association NT, the NT Grants Commission, and Regional Development Australia NT. The deputy’s job will thus be a significant boost to Cr Bonanni’s profile. She was elected by secret ballot after Cr Melky nominated Cr Chansey Paech, seconded Cr Jade Kudrenko. Cr Melky had earlier moved to change council policy and have an open ballot. Cr Paech seconded his motion but there was no other support. A show of hands would settle the committee elections if necessary. Some committees are internal to council; some are external, on which council has representatives. There were 28 to fill last night. Crs Heenan, Kudrenko and Paech were unopposed to chair council’s standing committees – Finance, Corporate and Community Services, and Technical Services respectively. Most councillors then proceeded to take on a variety of other committee roles, self-nominating or accepting the nominations of their fellows. Crs Kudrenko and Paech showed their keenness in taking on roles in youth, arts, environment and Indigenous affairs-related committees and on my reckoning will have the busiest committee schedules of any councillors bar the Mayor. In contrast, 10 committees were taken care of before Cr Melky was nominated by Mayor Ryan for council’s Sports Facilities Advisory Committee. He declined, without explanation. Mayor Ryan tried again for the Cemeteries Advisory Committee. Cr Melky appeared affronted: “I’m not going to do cemeteries, I’m sorry,” he said. It was not a good look, and he was shown up seconds later by Cr Bonanni who said she would be “happy” to do it, joining Crs Paech, Martin and Heenan. Cr Melky self-nominated for the Town Council and Tangentyere Council steering committee, joining Crs Kudrenko and Paech, with all three also accepting to be on the Town Council and Lhere Artepe partnership committee. Mayor Ryan also sits on both (not that a great deal has emerged from either to date as it has been hard to even get meetings to happen). 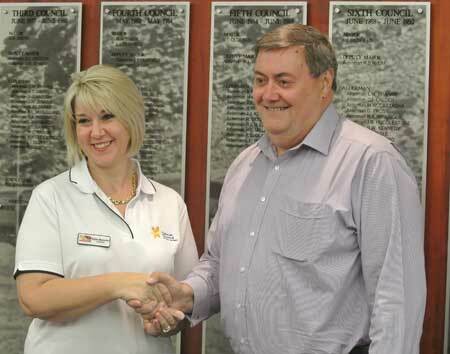 Cr Melky went on to decline a nomination for Tourism Central Australia but did self-nominate as a Local Government Association of the NT representative, joining Cr Paech. Committees settled, the next significant item of business was one which Cr Melky has driven, to do with what he has seen as an anomaly in one of the Management of Public Places By-laws. This has to do with the pouring out of liquor from opened containers in a public place. Cr Melky has argued that rangers are acting beyond their powers when they empty not only an open can of beer, for example, but as well all the closed cans from a carton. He has argued that a carton does not meet the definition of “container” in the by-laws. Council’s solicitor Chris Turner, in a written report, acknowledged “some force” to Cr Melky’s argument but did not agree that rangers would incur criminal liability in continuing to carry out the by-law enforcement as they have to date. This advice carried the proviso that Mr Turner is not a criminal lawyer. For Cr Melky that proviso was enough to take Mr Turner’s advice as no more than a “personal comment” and he maintained his position that it is simply “wrong” to tip out liquor from unopened containers. He found an ally in Cr Kudrenko, who also saw it as a matter of principle – “morally not the right thing to do”. She wanted to see rangers acknowledging people’s “common decency”, giving them “respect that they will make the right choice”. Cr Paech was of a similar view. Mayor Ryan pointed out the very small number of incidents involved: 17 standard drinks for January and February in 2014; a total of 304 for all of 2013, with half of those in the month of November. Cr Kudrenko rejected this reasoning: it was “not a question of numbers”, but rather one of “where council stands” in relation to a complex issue. Arguing his case, Cr Melky became more heated. He was not shouting but was not far off it when he described as “immoral, abhorrent and illegal” the instruction to rangers to commit an offence, apparently willed by Crs Heenan and Martin. His decibel level was lower but his arguments more hysterical when he countered Cr Brown’s use of the word “ridiculous” to describe the idea that a court would convict a ranger of such an offence. Cr Melky seemed to think opposition to his views had something to do with a challenge to his understanding of the language of the legislation, defending himself as a speaker of English as a second language and going so far as to say there’s “no reason for racial vilification”. At this point he was shut down by Cr Dave Douglas in the chair. His ally in argument, Cr Kudrenko, was now “uncomfortable” with the level of discussion and asked Cr Melky to respect the views of others. After more to-ing and fro-ing a vote was finally taken, not on changing the by-law but on simply giving rangers a direction to not pour out liquor from unopened cans. The motion was lost, supported only by Crs Melky, Kudrenko and Paech. Finally came the time for Cr Melky’s discussion of breaches of the Local Government Act. He read out the sections that he considered breached by an “improper disclosure” and “improper use” of information from the confidential session of council, dwelling on the penalties and commenting , “a long time in gaol”. Sure enough, the matter involved the report on this site concerning heated exchanges at two confidential sessions in which Cr Eli Melky was said by unnamed sources to have threatened a fellow Councillor with legal action, without having any reasonable cause to do so. This had been very unsettling for the Councillor concerned, according to the report. Cr Melky read out the email from Alice Springs News Online editor Erwin Chlanda indicating the content of the report (still in draft form) and inviting Cr Melky to comment. Cr Melky also read out his own reply, which was subsequently quoted in full in the report. His time to get support for speaking further on the issue was up, but Cr Paech seconded him in taking the matter further. Mayor Ryan said that “procedurally” it should be heard in the confidential session. However, Cr Melky argued that the matter was out in the open, being online. He asserted that he had not been given a right of reply, despite having already read out the email offering him one, and he now wanted this opportunity to respond openly. He said the breaches were bringing the entire council into disrepute as clearly the information in the Alice News had come from someone in the chamber. CEO Rex Mooney said that on the face of it there appeared to have been a breach of the Act, which brings with it serious penalties, but he insisted that it needed to be discussed in the confidential session, “notwithstanding that the article appeared online”. Cr Melky then provided notice that he would be giving the CEO an affidavit and letter requesting disciplinary action and naming names. He said that he would not participate in any discussion of the matter in the confidential session as it seems there are “no rules on confidential when it comes to this”. The Alice News has asked Mr Mooney whether Cr Melky’s request for disciplinary action will proceed. We will advise when a reply is to hand. No quite true Tut Tut. Sorry, it was Williams who sued Melky, you are right. It does show however Melky’s propensity for flying off the handle and using profanity when things don’t go his way. @ tut tut. You caught me out. Yes, married to Cr Steve Brown. And know personally Cr Bonnani, Cr Douglas, Cr Peach, Cr Jade, Cr Martin, Cr Melky and related through Steve to Cr Heenan and grew up with Mayor Ryan. There I have come clean. Ånd to those who don’t know I sometimes have an opinion. And my comment re the fool. Not meant for anyone. Just a comment. I read a comment criticize a fool and he will hate you. Critisize a decent man and he will thank you for your comment. Eli and Chansey … couldn’t think of a better suited couple! Can someone please tell the Councillors to worry about Council issues – footpaths, dogs, parking, parks, clean the toilets! They think they are famous reps of Australia. Bloody joke! Janet Brown @ posted March 20 2014 – And there is a sucker born every minute – Who are you referring to? And also scrolling down through some of your comments, and questions to others, may I dare ask, are you in some way in some sort of a relationship with Councillor Steve Brown? Truth is a wonderful thing in sentencing. Douglas Pearce @ posted March 20 2014 AT 9.24AM – Douglas your remarks about Melky suing a Darwin Athletics official are all wrong as are your continuing comments re the Judge throwing the case out of court, totally misleading as they insinuate Melky’s was thrown out of court. Lets get a few facts right here. Fact is the Darwin athletics official sued Melky. This was brought about by Melky standing up to the athletics official at a Darwin athletics meeting for refusing to award medals to the young Alice Springs athletes in races they had won. The athletic official sued Melky for comments made during the exchange where Melky insisted the junior Alice Springs athletes were entitled to be awarded the medals. The NT News reported at the time that the Chief Magistrate commented that the bringing of this case before the court by the Darwin athletics official was an abuse of the legal system. Truth in sentencing is a wonderful thing. And there is a sucker born every minute. I consider Cr Eli Melky to be one of the most honest people ever voted to the ASTC and he has a bit of intestinal fortitude as well. He is finding that one of the traits of the Alice is that it is the old “not what you know, but who you know” and woe to those that cross the line and do not kowtow to the right people. Keep up the good work Cr Melky, make them accountable and hopefully the people of Alice will recognise a good man at the next election because decent people like Eli are far and few between. Good job Kylie on becoming the deputy Mayor, keep being a strong woman leader. @Aaron “Cr Bonanni is riding on a name. I know both individuals and Cr Paech has been a lot more involved, coupled with a genuine keen interest in getting things done”. Aaron maybe if Chansey has been more involved in stuff its because he has been there longer, I dunno, but that seems like basic maths stuff to me ha ha. I don’t know them enough to call them friends but I’ve met both Chansey and Kylie and they seem to be equally nice genuine and down to earth people so I think the riding on a name comment is pretty nasty. I met Kylie at Daffodil Day last year. I wasn’t great and handling things because my family member was at end stage of fighting cancer and every time the phone rang I expected it to be that call. And then when someone I had never met before saw me start crying she cared and sat down with me for ages. I had never heard her name before then so don’t get that name stuff and we all know her name now because she’s in the council. Pat @ Posted March 18, 2014 at 8:09 pm – what an insult. Let’s turn your comment around shall we? People who live in town camps are all welfare, drug addicted drunks! I would NO MORE suggest that, than I would suggest that someone is a pillar of the community simply because of their street address. You show your ignorance ALP roots with that comment! Cr Melky’s true character is now coming to the fore. From my observations he invariably threatens and accuses when those with opposing views dare to speak against him. It reminds me of the time when he tried to sue an athletics official in Darwin with whom he had an altercation. The matter got all the way to the Supreme Court where thankfully the judge threw it out on the basis that it was a trivial matter which should not be taking up the Court’s precious time. The fact that he does not appear to have any support amongst his council colleagues does not surprise me. @ Melanie, I agree. Cr Paech would have been a much better choice as Deputy for the people of Alice Springs. Cr Bonanni is riding on a name. I know both individuals and Cr Paech has been a lot more involved, coupled with a genuine keen interest in getting things done. Having said that, well done Cr Bonnani, the role will be good exposure for you to both work and profile. To Cr Paech, spend your spare time on the bigger picture that better suits you: running for Greaterox, it’s there for the taking. In the past the incumbent had my support, not any more. We need new, young, fresh blood. I believe you have the makings. I am concerned how this story has turned from a congratulation to Kylie to full on attacks by Labor supporters. Chancey must be embarrassed by the posts because he is a decent and very pleasant young man. Please write about your support for Chauncey but keep your spiteful and incorrect gossip out. The deputy mayor position is a very shared role by elected members and usually by those with the available time to fulfill that obligation. The politics of envy is a nasty place place to dwell and remember, today is SMILE day. Oh happy days. Am I’m missing a ‘members only access’ section of this website where it explains how she (or a CLP operative) dropped from a wire fixed to the ceiling, (while dun-dun-dundun music played in the background…) and a switch of the secret ballots was made? I wonder why I’m picturing high school girls muttering bitchy comments about another girl at school…?? Are any of you lot seriously going to say that if you started a new job and your work mates realised after working with you (and not just looking at a photo on a website) that you had your head screwed on, and you were then recommended to go up the ranks. If they were the better choice – why isn’t it their picture up there? Melky appears to have anger management issues and is on the verge of a scary meltdown. Kudrenko seems to go with the flow but won’t go out on a limb and plays the ‘safe’ vote (let me guess, art major?). Paech actually seems the most trustworthy out of the three. But there’s no way that anyone who lives live theatre (dwelling on the penalties and commenting “a loong time in gaol”). I will watch this story unfold with interest and if Melky does eventually do a dramatic reveal – I will be extremely keen to hear those accusations. Well done to the council. It is not an easy path to navigate. The usual political support group emerges for a certain young councillor who is yet to prove his worth on anything beyond skateboards. Most committees are a waste of time and run at 30% efficiency. Not sure what you are insinuating Janet. I know Cr Paech, along with about half of Alice Springs. Not married, in a relationship, business or property deal. Does that satisfy your curiosity? Shame would have been good to have an Indigenous Deputy and one that doesn’t live in the Golf Course… How in touch are these mob with the people… Not a lot I tell ya…..
Liz was a true reflection of the people of Alice, honest, hardworking and has a good sense of humour. Wonder if Bonnani will get down to visit the town campers? What a disappointing result for Cr Paech and the community. I have watch this young man over his term on council and have to say that he and Cr Kudrenko have performed exceptionally well. I have no doubt that they would have been great at the role. It’s a shame to see Cr Bonnani elected so soon. One has to question that as she is so new and not across the operations, governance and functions of council or was this the CLP playing politics and blocking non CLP councillors? By the sounds of this article it never changes the particular councillors required to take on most of the work !!! Crs Heenan, Kudrenko and Paech were unopposed to chair council’s standing committees – Finance, Corporate and Community Services, and Technical Services. Why didn’t anyone else nominate? These are important roles for elected member to fufill. Cr Kudrenko has proven to be a shining star in my eyes, she is committed and passionate about the environment and the small things that council offers – KUDRENKO for mayor I say !!! Douglas and Heenan, on the other hand, I hope that they are in their last terms blabbering. Be interesting to see how council operates under a Ryan/Bonnani rule, look out Damien might be Mayor Bonnani soon !!!! Janet love, have the CLP LET YOU AND STEVE BACK IN YET OR ARE YOU STILL TOO RIGHT WING FOR THEM ??????? I know Monday was St.Patricks day but it seems like it was the 1st April. @melanie might have been better to inform the readers of your affiliation to Cr Paech. Best wishes to Cr Bonanni on her new role. An astounding rise in only four months. And while I certainly don’t want to undermine her capacity or ability, the reality is after only four months on council she really hasn’t had time to show what she’s capable of. She seems to have made a name for herself by indulging in headbutting competitions with Cr Melky, which no doubt has endeared her to the Mayor. I think it’s a real shame Cr Paech didn’t get the guernsey. From my observation a dynamic young man who has been speaking up for the community – championing the cause of parents seeking an all ability park, pointing out the need for the NT Government to invest in economic stimulation in our town, and taking up the cudgels for skateboarders. Which probably didn’t endear him at all to the Mayor. And the others in the Conservative bloc in council who supported the meteoric rise of Cr Bonanni. Interestingly Cr Melky, who is open about his political affiliations, is supported Cr Paech, who is equally open about his opposing political views. It’s a great shame Mayor Ryan didn’t take the opportunity to support the development of local young people like Cr Paech. Hopefully more of our councillors will take the opportunity to put petty politics aside next time round.